Kont qieghed nifli xi pubblikazzjonijiet li hareg il-Partit Nazzjonalista qabel l-ahhar elezzjoni ta' April 2003. U sibt ktieb ta' propaganda li minnu hadt is-silta li qieghed nippublika hawn taht. Tbissimt mill-ewwel x'hin qrajt dak li kitbu. Sejjer niprepara xi materjal informattiv fuq il-kwistjoni tal-ekonomija taht il-PN. Niggarantilkom li hemm bahar jaqsam bejn dak li kitbu u l-verita. Tajjeb, mela skond il-Partit Nazzjonalista, il-Gvern Nazzjonalista rega' ta spinta lill-ekonomija. Se nibda mis-sena 1992, meta l-Partit Nazzjonalista rebah l-elezzjoni. Kienet it-tieni legislatura tieghu wara li kien rebah l-elezzjoni tal-1987. Fl-ewwel legislatura tieghu il-Gvern Nazzjonalista harbat kull ma sab. Il-flus, wirt Gvernijiet ghaqlin Laburisti nefaqhom. Imma wara hames snin ta' xalar bejn l-1987 u l-1992 il-Gvern Nazzjonalista sab li spiccatlu dik il-hegga li wera qabel. L-isforz li johloq xi progett bil-flus li sab biex ghalinqas il-pajjiz jidher li qed jiehu xi direzzjoni, ma setax ikomplih ghax inheleb u mieghu heleb miljuni kbar ta' liri. Is-sitwazzjoni bdiet tisserja. Kemm dam bil-flus f'idejh il-Gvern kien jidher li qed jaghmel xi haga. In-negozjanti hasbu li bdejna hajja gdida, l-investituri hasbu li kellna gvern ghaqli u tista tafdah. Imma hemm limitu ta' kemm tista tixxala minghajr ma tahdem biex tpatti ghal dak li tohrog. Kulhadd bravu biex jonfoq flus haddiehor. Il-Malti jghidlek li tiehu minghajr ma trodd, is-swar thott. U hekk kelna mis-sena 1992 il-quddiem. Il-Gvern Nazzjonalista baqa jpingi stampa li Malta ekonomikament kienet sejra l-quddiem meta fil-fatt minhabba t-tberbieq li sar, l-abbuzi li saru u bis-sens ta' libertinagg li dahhal fil-pajjiz, l-ekonomija habtet ma' blat zonqri. L-istampa li ta l-Gvern ta' kwiet industrijali ma kienet xejn ghajr attentat biex jostor il-verita. Bil-flus seta jixtri l-paci fil-pajjiz minflok jahdem ghalih. Dan ikkonfermatu The Malta Independent f'Novembru tal-1993 meta qalet, "The industrial peace of the past years could therefore never be everlasting. Indeed, one fears it was artificial peace." Ghall-ewwel, ftit kienu dawk li indunaw. L-opposizzjoni Laburista li allura kienet taf li taht it-tlellix ta' barra kien hemm qafas ekonomiku immermer, bdiet taghti messaggi ta' allarm biex il-poplu jintebah x'kien qieghed jigri. Ftit ftit, mhux il-Partit Laburista biss beda jilmenta mis-sitwazzjoni, imma anke azjendi, unjons, ghaqdiet ohra u xi kultant xi Nazzjonalist . . . fil-miftuh. Bhala indikatur ta' kemm l-ekonomija hijiex b'sahhitha jew le hemm il-konsum pubbliku. Fejn jidhol konsum, in-negozjanti generalment iharsu lejn zewg avvenimenti ewlenin matul is-sena, il-fiera kummercjali tan-Naxxar (Trade Fair) f'Lulju u l-bejgh matul il-festi tal-Milied f'Dicembru. Dawn huma l-akbar zewg indikaturi li jirriflettu kif sejra l-ekonomija fil-pajjiz. Jekk in-negozju jkunu b'sahhtu ghandek ekonomija b'sahhitha imma jekk in-negozju hu batut ghandek ekonomija ghaddejja minn krizi. Mill-ewwel beda jberraq wara r-rebha elettorali Nazzjonalista tal-1992. Meta gejna ghall-festi tal-Milied tal-1992, in-negozjanti irrapurtaw li kien naqas il-bejgh matul il-festi. Dan gie rrappurtat minn The Times tat-22 ta' Dicembru tal-istess sena. Fi Frar tal-1993, il-GRTU wissiet li l-inflazzjoni u r-ricessjoni kienu resqin lejn Malta. F'Mejju imbaghad is-Segretarju Generali tal-UHM habbar li r-ricessjoni bdiet tinhass f'Malta. Fl-istess xahar, Dr. Austin Gatt ma laqlaqx. F'The Sunday Times tad-9 ta' Mejju qal, "I think it is a realization of the fact that the government has through its various measures, slowed down economic growth." F'Gunju, survey li sar mill-F.O.I. irraporta li, "It is clear that local industry is now feeling the effects of the recessionary environment ..."
F'Ottubru tal-1993, The Sunday Times qalet, "... we must not allude ourselves that dangers caused by the effects of the recession ... are not lurking outside our doorstep." The Times minn naha l-ohra fl-ewwel ta' Ottubru habbret li bejn l-1991 u 1992 it-tkabbir ekonomika kien naqas minn 7 fil-mija ghal 4.5 fil-mija. F'Dicembru imbaghad kien l-istess Dr. Fenech Adami li fil-parlament qal, "Ir-ricessjoni taqtitna fil-laham il-haj". Fl-istess xahar il-Ministru John Dalli gie rrapurtat minn The Sunday Times li qal hekk, "Economic growth during 1993 has been held back by the impact of worsening recessionary influences abroad." U nibqghu f'Dicembru u l-president tal-Kamra tal-Kummerc ipponta subajgh lejn il-gvern u qal, "Problems facing Malta over the past year... had arisen from the direct or indirect policies of the government." Il-verita dwar min jahti ghal dan kollu harget fil-miftuh!! Tinsewx li fil-Milied tal-1992 in-negozju ma kienx tajjeb. U fil-Milied tal-1993 . . . kompla sejjer lura. B'ittri kbar, The Times tat-30 ta' Dicembru habbret, "Christmas sales down on last year's volume." Tinsewx ukoll li t-tkabbir ekonomiku bejn l-1991 u l-1992 kien naqas minn 7% ghal 4.5%. U fis-sena 1993 kompla jinzel . . . ghal 3% skond kif habbar il-Bank Centrali. F'April tal-1994 il-GRTU habbret li l-industrija tal-kostruzzjoni kienet f'ricessjoni minhabba mizuri fiskali li dahhal il-Gvern. Minkejja dawn is-sinjali kollha ta' problemi ekonomici, xorta l-Gvern Nazzjonalista baqa jiprova jghatti x-xemx bl-gharbiel. F'Gunju, il-membru parlamentari Michael Bonnici qal, "The recession which had severely hit Europe had not effected Malta at all." Alla jbierek!! Problemi ekonomici kullimkien fil-pajjiz u Michael Bonnici jghid l-oppost. Kien hemm xi hadd fil-Gvern li lil Bonnici canfru? Le!! L-F.O.I. ma hallitux minghajr risposta ghax habbret li, "Smaller firms have reported a much more negative local market order book position and the survey reading in their regard is the worst recorded for over a decade." Prosit mela, azjendi zghar irrapurtaw sitwazzjoni hazina, l-ghar f'aktar minn ghaxar snin jigifieri ghar minn meta kelna Gvern Laburista. Minkejja kollox, il-Gvern Nazzjonalista baqa jberbaq. Ghalih il-flus qatt ma kienu problema . . . ghax huma flus ta' haddiehor. Minflok fetah ghajnejh u kkontrolla l-infieq tieghu, ghamel l-oppost. Il-Partit Laburista, konxju mill-fatt li l-problemi ekonomici f'Malta kienu qed jisserjaw, baqa jhambaq fuq kontroll tal-Gvern fl-infieq tieghu. Ghalinqas The Malta Independent ta' Gunju 1995 qalet, "It would be difficult not to share Dr. Sant's fears about rising public expenditure." F'Ottubru, l-F.O.I. habbret, "The prevailing economic environment is deteriorating." U The Malta Independent editorjalment qalet, "The business community sees thick black clouds looming overhead and forecast turbulent times ahead." Jekk imbaghad nigu ghal-1996 insibu li qabel tilef il-poter il-Partit Nazzjonalista, f'pubblikazzjoni tal-GRTU qrajna li, "Business community reports falling sales and rising costs." U biex zgur tinfaqa' l-buzzieqa Nazzjonalista li l-Maltin qeghdin tajjeb finanzjarjament, insibu lis-Sinjura Gemma Mifsud Bonnici (il-mara tal-ex President tar-Repubblika Ugo Mifsud Bonnici) li f'Gunju wkoll qalet, "There is hidden poverty on the island." ara The Times tal-24 ta' Gunju. Is-sindku Nazzjonalista tal-Mosta wkoll f'Awwissu qal li, "(Mosta) business had declined not because of the traffic system but because there was a business slowdown in Malta in general." Dan wara li kien hemm tentattivi sabiex in-nuqqas ta' negozju fil-Mosta jigi attribwit ghal mod kif dawwru s-sistema tat-traffiku. Insomma min ikun qed jeghreq anke ma' tibna jiprova jzomm. Minkejja l-istampa sabiha li l-Gvern Nazzjonalista baqa jpingi lill-poplu sal-ahhar jum tal-legislatura, minn wara l-kwinti il-Gvern kien mifni bi problemi finanzjarji kbar. Jghidilna l-ex ministru tat-trasport Michael Frendo, "Apparently up until this year (1996) the (budget) money had just not been available. It took a great deal of negotiating and fist banging on table tops to get it." Tant spicca finanzjarjament ezawrit il-Gvern Nazzjonalista li l-anqas biss ghamel budget ghas-sena 1997. Fil-pagna Economists, The Sunday Times tas-17 ta' Novembru 1996, qrajna li, "The ludicrous thing was not only that the Nationalist Government failed to make an imaginative pre-election budget but that it failed to make a budget at all." Dwar il-politika tad-dejn u falliment ekonomiku, The Sunday Times f'Settembru 1997 kitbet, "Clearly... much more could have been done by the previous (Nationalist) administration to limit losses whether in parastatal corporations or ordinary government administration." Bl-akbar arroganza u bil-wicc tost, il-Partit Nazzjonalista, li fl-ahhar tal-1996 sab ruhu fl-opposizzjoni, beda jwahhal fil-Gvern Laburista ghal-problemi finanzjarji li Malta kellha. The Malta Independent canfret bl-aktar mod dirett lill-PN f'Awwissu tal-1997 meta qalet, "The Nationalist Party in opposition is increasing its dose of attacks on the (Labour) government without attempting a proper analysis of the serious mistakes it committed at mismanaging the economy in the last two-three year period of its term of office. In order to understand where we stand we have to analyze the performance of the past five years. In this regard, the Nationalist administration is mainly to blame. An artificial feel good factor was spread since no one apparently was carrying the burden. On a political level it is the Nationalist Party which must now explain why it allowed such damaging (economical) policies to be implemented." U din l-ispjegazzjoni minn naha tan-Nazzjonalisti baqghet ma giet qatt. Mhux talli hekk, talli biex jghattu l-falliment taghhom komplew iwahhlu fil-Gvern Laburista u ghadhom sa' llum. U The Malta Independent f'Settembru kompliet, "The last Nationalist administration must assume full responsibility for having allowed government expenditure to grow to an unsustainable level." U f'Settembru wkoll qrajna f'The Times li, "Over the past six years the F.O.I. has repeatedly warned the government of a rising structural deficit in its recurrent expenditure which was considered to be alarming and did not make economic sense." U min ma jiftakarx it-twissija famuza ta' John Dalli lil Dr. Fenech Adami f'Gunju tal-1996 li l-Gvern Nazzjonalista kien ser jispicca zbaljat bil-kbir finanzjarjament ghal dik is-sena? Mhux ta' b'xejn l-anqas biss ghamlu budget!! Jien ghidtilkom li l-PN baqa ma ammettiex l-izbalji li ghamel u li l-ekonomija marret lura fi zmienhom. Nippreciza. Dr. Fenech Adami ammetta WARA li tilef l-elezzjoni tal-1996 u nkixef wahda sew. Imma wara kulhadd bravu. Is-serjeta titlob li ghandek tkun onest mal-poplu waqt li tkun ghaddejja l-problema u mhux titfa l-problema fuq haddiehor. Intant, f'The Times f'Ottubru 1997, Dr. Fenech Adami ammetta hekk, "In our time there was an economical slowdown, yes." Prosit xi rgulija dik!! Ghax ma ammettiex meta HU kien fil-gvern? Ghaliex ma ammettiex meta kullimkien madwaru kellu sinjali cari ta' falliment ekonomiku? Ma ammettiex ghax ried jahbi l-verita mill-poplu? Jew ma ammettiex ghax ma kienx jaf f'hiex kien il-pajjiz? Ghazlu liema tridu, tkun xi tkun l-ghazla xorta jibqa l-fatt li Dr. Fenech Adami qarraq bil-poplu Malti ghal snin shah. The Sunday Times fakkret lill-PN li parti mill-problemi ekonomici li ghandha Malta gej mill-deficit tal-Gvern stess. F'April tal-1998 din il-gazzetta kitbet, "The Nationalists must of course shoulder their share of responsibility for the widening fiscal deficit." U l-Gvern Laburista x'ghamel meta tela fil-gvern fl-1996? L-ewwel haga kienet li qal lill-poplu l-istat miskin tal-pajjiz li fih gabu Gvern Nazzjonalista. In-Nazzjonalisti ma hadux gost jigu mikxufa, imma l-poplu kellu d-dritt ikun jaf x'halla warajh il-PN. Tiftakru inthom kemm irrabja Dr. Fenech Adami meta beda jisma lill-Gvern Laburista jikxef il-hnizrijiet finanzjarji li sab. The Malta Independent on Sunday qaltilna f'Settembru 2000, "The 22-month-old Labour government (was) correct in pointing out the serious state of the country’s finances." Mela fil-waqt li l-Gvern Nazzjonalista heba s-sitwazzjoni, il-Gvern Laburista gharraf lill-poplu bil-verita. U mill-kliem il-Gvern Laburista ghadda ghall-fatti. Inhalli f'idejn The Malta Independent on Sunday biex tghidilna hi, "The Malta Independent on Sunday supported the Labour Government’s attempts (however short-lived) between 1996-1998 to cut expenditure and to reduce the size of the public sector – which was then criticised (wrongly in our view) by the Nationalist opposition." Hemm ahna, rajtu min verament ipprova jikkontrolla s-sitwazjoni u jrazzan l-infieq sfrenat tal-gvern? Se naghtikom ezempju iehor dwar is-serjeta tal-Gvern Laburista biex Malta terga tiehu r-ruh. 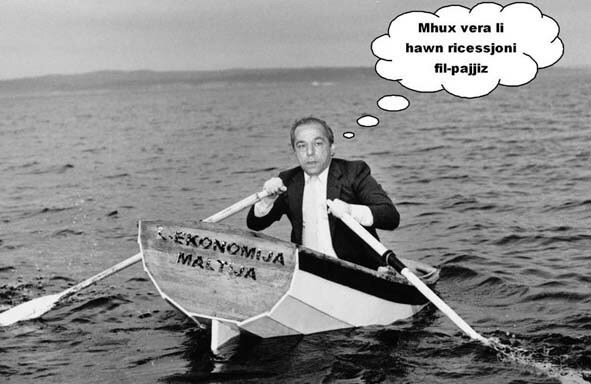 The Malta Independent f'Ottubru 1998 qaltilna hekk, "When the MLP government came in, two years ago, it raised hell because it found that the (Gozo Channel) company was practically bankrupt, which it was. Instead of adopting the previous government’s broad outlook, it concentrated on the profit and loss accounts of the company itself: put the price up, cut out, which was a good thing, all the flab and the cases of downright corruption, and reduced the trips to the scheduled ones only. In a short term Gozo Channel was flourishing again, as a company." U ezempju iehor, din id-darba il-Gvernatur tal-Bank Centrali li f'April 1998 gie kkwotat li qal hekk, "Government revenue is increasing as planned while measures taken to cut government expenditure are evidently working." U fil-waqt li l-Gvern Laburista beda jaqta l-hala li kien hawn kullimkien xorta wahda ta imbuttatura lill-ekonomija billi beda diversi progetti. The Times f'Marzu tal-1998 qaltilna li, "Building contractors have greeted major projects announced over the last few days by the government with optimism, describing them as a significant step in the right direction." Fl-1998 il-PN rega tela' fil-Gvern ghax nofs il-Maltin milli jidher ma jitghallmu qatt. U r-rekord finanzjarju negattiv tal-Gvern Nazzjonalista ta' qabel l-1996 rega kompla wara l-elezzjoni. Stajna nobbsru x'kien gej. Meta l-poplu rega tella' lill-istess nies li faqqru pajjiz, allura x'tistenna? Fl-1999 Dr. Fenech ammetta li fi zmienhom, "There were serious financial problems." Ara The Times tas-7 ta' Settembru ghax l-anqas temmen! F'Ottubru 1999 il-Malta and Gozo Restaurants Association habbret li 84% tar-ristoranti rraportaw li n-negozju ghall-1999 kien ghar mis-snin ta' qabel. U min bela' l-propaganda li l-ekonomija se tmur il-quddiem taht il-PN mar imqarraq. The Malta Independent on Sunday f'April tal-2000 qalet, "It is clear that most people have not been particularly impressed by the economic record of this (Nationalist) government ever since the Nationalist party won the September 1998 general election." U kompliet, "The country badly needs some new ideas and the economy desperately needs to get moving again." Imma fejn konna bqajna. Johrog il-president tal-F.O.I. f'Marzu tal-istess sena u jghid, "The economy cannot be said to have taken off since the change of government in 1998." Terga The Malta Independent on Sunday, "A (cabinet) reshuffle is needed first and foremost because the economy has not reacted to the change in government in September 1998 as we all expected it to react." (Hawnhekk nigbed l-attenzjoni ta' The Malta Independent on Sunday li mhux vera "as we all expected it to react", nies b'rashom fuq ghonqhom kienu jafu xi jsarraf gvern Nazzjonalista u ma kienu qeghdin jipretendu xejn posittiv, allura mhux "we all" ghax jien wiehed minn dawk li l-Gvern Nazzjonalista naf xi jsarraf). Wara l-fiera kummercjali tan-Naxxar tal-2000 il-GRTU qalet li nofs dawk li hadu sehem fil-fiera rrapurtaw tnaqqis fil-bejgh. Fejn jidhlu ristoranti, s-sitwazzjoni xejn ma kienet sabiha l-anqas. The Sunday Times habbritilna hekk fl-10 ta' Settembru, "A survey shows a drastic drop in sales by restaurants between January 2000 and August 2000 – some even saw a drop of between 35 and 40 per cent." Imbaghad Dr. Fenech Adami qalilna "In general, we could have performed better in all areas." – rrapurtat minn The Times tat-9 ta' Settembru. Imn'Alla qalilna ghax l-anqas konna ndunajna!! Nergghu nigu ghal-Milied din id-darba tas-sena 2000 u The Malta Independent habbret li, "The crowds are out, but some shop owners say it’s the worst Christmas they have experienced in the past years." U ghal budget ghas-sena 2001 il-Gvern zied it-taxxi galadarba ma kellux pjani ohra kif iqajjem l-ekonomija u jdahhal aktar flus. The Malta Independent on Sunday f'Dicembru 2000 qaltilna, "So the (Nationalist) government chose the easy option in order to increase its revenue – it imposed more taxes on the hard working tax-paying middle classes. This was wrong for a number of reasons … politically it was a mistake … morally it was shameful …economically it made no sense." Fi Frar tal-2001 il-GRTU wissiet lill-Gvern li, "many businesses had a cash flow crisis" (ara The Times tat-23 ta' Frar). F'Mejju The Malta Independent ippruvat (ghalxejn fl-opinjoni tieghi) tiftah ghajnejn Dr. Fenech Adami. "The prime minister must understand that there are many people out there who are having to struggle for their daily living because of the downturn in the economy." F'Lulju, l-F.O.I. giet irrapurtata li, "expresses grave concern at the situation affecting a number of small and large enterprises over the past year". – The Times tal-20 ta' Lulju. Inkomplu bil-litanija ta' ahbarijiet ekonomici ta' nkwiet. Fil-fiera kummercjali tal-2001 46% tal-esebituri irrapurtaw tnaqqis ta' bejgh. F'Awwissu The Times habbret, "The Malta Chamber of Commerce has warned that according to recent surveys it carried out among its members, the economic situation is not as bouyant as figures alone depict it to be." imbaghad inkomplu . . .
"Only 32.3% believe that “the worst is over” in our economy." (Dicembru) The Malta Independent on Sunday. “Technically speaking we are going through a recession … it would have been better had the government acknowledged this fact." (Dicembru) The Malta Independent on Sunday. “Total manufacturing turnover in the first 9 months of 2001 dropped by Lm95.5 million" (Economic Survey mahrug mill-Ministeru ghas-Servizzi Ekonomici) The Times f'Novembru. "Malta was facing a recession." (Il-President tal-GRTU) The Times f'Dicembru. Jonqos il-bejgh tal-karozzi. “Up to 43% drop in car sales in 2001 qaltilna The Malta Independent on Sunday f'Dicembru. Survey mill-F.O.I. wera li, "The loss in momentum in the manufacturing industry registered in the first half of 2001 continued throughout the rest of the year." Imbaghad nigu ghas-sena 2002 u r-rittmu negattiv kompla. “At present we are not attracting enough foreign investment" hekk qal Joseph Farrugia, direttur generali tal-Malta Employers' Association f'Awwissu 2002. “Sales by manufacturing enterprises in 2nd quarter 2002 drops by Lm11.8 million compared with same quarter of 2001." Qaltilna The Times f'Settembru 2002. “Over half the entertainment establishment owners at St. Julians, Sliema and Paceville say that their business had fared worse in the past four months compared with the same period last year." Irraportat The Times f'Settembru 2002. “Income from business shrank” – Tony Micallef, sid ta' ristorant f'Paceville, f'The Times f'Novembru 2002. Matul l-2003 imbaghad l-ekonomija baqghet tmajna. Il-qaghad kompla jizdied. Dr. Alfred Sant kompla jinsisti mall-gvern li jkun ahjar li jikkoncentra fuq il-problemi interni tal-pajjiz l-ewwel minflok jigri u jinheleb wara shubija fl-Unjoni Ewropea. Wissa bi problemi ekonomici jekk Malta tidhol membru. In-Nazzjonalisti ukkuzawh li kien qieghed ibezza u jxewwex, imma l-fatti wrew li Dr. Sant kellu ragun. Il-fabbriki vera bdew jaghlqu u l-qaghad vera beda jizdied u dan seta jarah kulhadd. Il-mezzi tax-xandir kienu u ghadhom ihabbru dan. The Malta Independent iddiskrevit lill-Gvern f'Lulju 2003 hekk, "It would seem that the government has the Kiss of Death. Anything it touches, it turns into a loss-maker. No wonder it itself is the biggest loss-maker and debt-increaser, and deficit-creator around." The Malta Financial & Business Times tat-12 ta' Novembru kkwotat lill-GRTU, "GRTU warns of economic slowdown, business losing hope". Dan meta l-PN kien wieghed Rebbiegha Gdida u qal li Dr. Sant kien qieghed ibezza!! U xi nghidu ghal din ic-cirasa fuq il-kejk? "The government must bear responsibility for the country's economic situation because it has been the same party in government with almost no interruption since 1987" – Harry Vassallo, Chairman tal-Alternattiva Demokratika (The Times Ottubru 2003). Fil-15 ta' Dicembru 2003, The Malta Institute of Management qalet li, “the Maltese economy is in a slowdown” . . . imbaghad qalet, "the economy was in a cyclical downturn." Min haseb li s-sena 2004 kienet se tkun ahjar u li l-ekonomija kienet ser tiehu r-ruh, bhas-soltu mar imqarraq. “There is a climate of uncertainty with regard to the economic situation of the country.” qalet The Malta Independent 4.6.2004. Dan meta suppost Malta kienet mahkuma minn entuzjazmu ekonomiku gdid wara li sirna membri shah tal-Unjoni Ewropea. Imbaghad gejna ghal famuza fiera internazzjonali ta’ Malta ta’ kull sena fin-Naxxar. Bhal dejjem din il-fiera hija indikatur tajjeb ta’ kif sejrin l-affarijiet. U kif mistenni, in-negozju fil-fiera mar hazin. “Exhibitors at the International Trade Fair, which closed last weekend, reported bad sales all around.” irrapurtat The Malta Independent on Sunday tat-18 ta’ Lulju 2004. "The economy is not doing well." qalet The Times fl-editorjal tat-22 ta' Lulju 2004. U l-Malta Today tal-25 ta' Lulju fl-editorjal qaltilna li ghaddejjin minn, "a time of increased economic uncertainty". Imbaghad fi Frar 2005 kien imiss lill-F.O.I., “Referring to recent talks at the Malta Council for Economic and Social Development, Mr Borg said that ‘it is in our interest to make a joint effort - the government, trade unions and employer organisations - to get the economy back on track". Dan kliem Anton Borg il-president tal-federazzjoni. Qrajtuha? Irridu npoggu l-ekonomija “back on track”. Issa staqsu lilkom infuskom min tefa’ l-ekonomija Maltija “off track”. Konferma tal-problemi ekonomici li l-pajjiz ghaddej minnhom inghatat mill-professur Edward Scicluna li f’The Malta Financial & Business Times tas-6 ta’ Lulju 2005 qal, “when you look at the economy’s performance over the last five years you realise it is currently experiencing one of the longest, though admittedly not the deepest, recessions ever endured since the Second World War.” Prosit! Mela taht Eddie u Gonzi qeghdin ghar milli qatt konna taht il-Labour ta’ Mintoff, Karmenu u Alfred Sant, taf int dawk in-nies (skond il-PN) li tefghu l-ekonomija lura!! Wara d-dizastru tat-Trade Fair tal-2004, gejna imbaghad ghal dik tas-sena 2005. M’hemmx ghalfejn tilghabu imhatri fuq kif marru l-affarijiet. “Seventy per cent of participants in this month's Malta International Trade Fair fared worse than last year” habret il-GRTU wara li ghalqet il-fiera. Ftit taz-zmien wara l-GRTU kompliet, “It is clear that the Maltese economy is in a state of stagflation, a situation where the economy experiences constant inflation increases without a corresponding increase in sales and jobs.” Irrapurtat The Times tas-sittax tax-xahar. F’Settembru imbaghad Edward Fenech ir-raprezentant ekonomiku tal-Alternattiva Demokratika qal f’konferenza tal-ahbarijiet, “Scrutinising the recently published economic figures from the National Statistics Office for the quarter ending June 2005 … the economy was effectively in a "coma". Ara rapport ta’ The Times tat-12 ta’ Settembru. Nigu issa ghall-kummerc fil-Milied tal-2005. Jghidilna Philip Fenech, president tal-Hospitality & Leisure Section tal-GRTU… “Bar and restaurant owners are struggling to make ends meet this Christmas … the bar and restaurant owners understand that they have to work with what they have … this year, because of a weakened economy and higher costs, it appears that people are being extremely cautious with their money … mainstream outlets are reporting that bookings for the Christmas period are not good at all … the number of Christmas parties had fallen drastically … There is no Christmas spirit in Paceville and many bars are remaining closed because there are no patrons. Tourism is also bad and this just makes the situation worse.” Ara The Malta Independent tal-21 ta’ Dicembru. Stharrig li sar mill-GRTU wera: “Twenty-nine per cent of respondents said that their turnover had remained the same as the same period last year, 52 per cent said they had registered a decrease of between 10 and 30 per cent while only 19 per cent said turnover had increased. In comparison, only 12 per cent said that profits had increased by between 10 and 30 per cent while a staggering 63 per cent said that their profits had fallen by between 10 and 30 per cent. A quarter of respondents said their profits had remained the same.” Dan gie ippubblikat f’The Malta Independent tal-10 ta’ Gunju. Nigu ghalhekk ghal-Milied 2006. Skond in-Nazzjonalisti kien Milied tajjeb hafna. Araw il-media kollha Nazzjonalista u tahsbu li kull Malti rebah is-Super 5 u ta ghal-hala’ b’xiri bl-addocc kullimkien. Il-buzzieqa naturalment ma damitx ma nfaqghet. Araw dawn l-iscreen shots t’hawn taht biex taraw id-differenza enormi bejn dak li riedu jpingu l-PN u dak li fil-fatt sehh. Gejna imbaghad ghat-Trade Fair tas-sena. Il-kliem tal-GRTU kien car bizzejjed, “A GRTU survey among exhibitors at the trade fair has found that 48 percent had a worse performance than last year, GRTU director general Vince Farrugia said today.” (irrapurtat minn The Times). L-istess ahbarijiet rrapurtaw sorsi ohrajn. “Restaurateurs say this Christmas has been a bad one for them, some reporting a dramatic drop in sales. Owners and managers of restaurants in Malta's main entertainment areas said that when compared to the same period last year staff parties in particular have decreased significantly. Alex Scudamore, the manager of Bouzouki in St Julians, said there was a 40 per cent slide in sales over the past two months. “It has been the worst Christmas in 29 years” Mr Scudamore lamented, stressing that he could speak on behalf of all the catering establishments in the area. The number of staff parties dropped drastically, he said. “I'm not saying that we're empty but the customers are simply not coming”. His comments come in the wake of similar complaints by retailers who told The Times that most people were “window shopping” rather than buying in the run-up to Christmas. They blamed the situation on the uncertainty brought about by the higher water and electricity rates and the lay offs announced in the past months. The president of the Malta Employers' Association, Pierre Fava, predicted more of a “bleak time” for shops in the New Year. Most restaurateurs are doing their utmost to make the best out of what's left of the holiday season but their outlook generally is not rosy either. “If it's bad now, wait till they get the bills,” a restaurateur, who is preparing several New Year's eve parties, commented, referring to the new water and electricity tariffs. He was still positive for the season though, saying the dip in business over the past few days could well be because people are waiting for the end of year parties to kick off. Yet, the new energy rates remain a looming concern with some owners complaining that the bills will eat into their narrowing profit margins. Even establishments in popular venues such as Valletta Waterfront complained. The manager of the Hard Rock Café there said that the only reason they had customers during Christmas week was because the neighbouring restaurants happened to be closed on one of the nights. He reported a big drop in sales, adding that he notices fewer people walking along the seafront. Many establishments reported that the seasonal surge started late when compared to last year, in some cases as late as three weeks into the Christmas period. Other establishments said the drop was less noticeable and that customers were coming and going but spending less than they would usually do, buying cheaper wines and skipping starters.” Dan kollu deher f’The Times tad-29 ta’ Dicembru 2008. U minkejja l-istampa pozittiva li pprova jaghti Lawrence Gonzi dwar il-futur ekonomiku, il-UHM hasbet mod iehor. “The Union Ħaddiema Magħqudin yesterday said it was worried about the economic forecast for 2009 and 2010 and had asked for a meeting with business leaders. The union pointed to the recent statistics showing relatively high inflation, growing unemployment, deficit and public debt, coupled by a slump in economic growth foreign direct investment.” Rapport ta’ The Times tal-14 t’April.